Rebellious move...Nancy Clench and author Claire Askew enjoy a sneak peek of the Rebel anthology, ahead of its launch for Book Week Scotland this year. Rebel is the theme at the heart of this year’s Book Week Scotland and it will be celebrated at local events too. Now in its seventh year, the festival is being staged from Monday, November 19, to Sunday, November 25. Book Week encourages people of all ages and walks of life to come together in libraries, schools, community venues and workplaces to share and enjoy books and reading. Working with a wide range of partners, Scottish Book Trust – the national charity which aims to change lives through reading and writing – will also deliver events linked to the Rebel theme. Rebel will be distributed free to community groups and libraries during Book Week Scotland; it will also be downloadable from the Trust’s website at www.scottishbooktrust.com. Marc Lambert, Scottish Book Trust CEO, said: “We are delighted to distribute 100,000 copies of Rebel as part of our Book Week Scotland celebrations. In Linlithgow, two events are being staged as part of the celebrations. There’s a Scottish-themed Bookbug Session in the town’s library on Thursday, November 22, from 10.15am to 10.45am. It’s billed as a fun and friendly event for babies, toddlers, pre-schoolers and their families to enjoy. The session is free but ticketed so please book in advance on 01506 283880. A coffee morning will also be staged at Linlithgow Library on Thursday, November 22, from 10.45am to noon. It’s a chance for visitors to view the library’s extensive collections of Scottish material, while enjoying some refreshments. The free, unticketed event is open to anyone with an interest in Scottish literature. 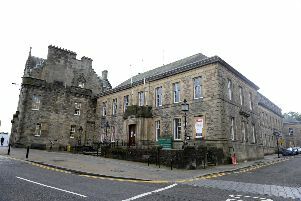 Sadly, the Bo’ness Library event on November 19 – offering fans the chance to meet and find out more about author Rachael Lucas and her connection to the town – has been cancelled. However, there is a much wider programme of events in the wider West Lothian and Falkirk areas, featuring a range of popular authors and personalities. Erin McElhinney, Creative Scotland’s literature officer, said: “Scottish Book Trust has produced a programme that offers a whole host of routes into reading and writing, offering a cause to the rebel in all of us. Meanwhile, schools in the Journal and Gazette area are being encouraged to take part in Book Week Scotland. The three picture books which are currently shortlisted for the Bookbug Picture Book Prize are being gifted to every Primary One pupil in Scotland. Free bags of books, writing materials and counting games will also be gifted to all P2 and P3 pupils, thanks to Education Scotland and the Scottish Government as part of their Read, Write, Count initiative. Visit www.scottishbooktrust.com for more details on the book week initative. For listings of local and national events, visit www.bookweekscotland.com. Fiona Hyslop, Linlithgow MSP and Culture Secretary, is encouraging constituents to get involved. She said: “As a life-long and avid reader, I know that there’s no greater pleasure than losing yourself in the magic of a book. “That’s why I welcome the launch of the 2018 Book Week Scotland programme. “It’s a flagship event in Scotland’s culture sector, celebrating books, reading and Scotland’s rich literary history – dedicated this year to exploring the theme of Rebel. “For the seventh consecutive year, the Scottish Government is proud to support this incredible event which stems from the Scottish Government’s commitment to literature. “Part of that commitment is ensuring more people can access and enjoy cultural activity more often. such a fantastic programme of events and activities across Scotland, which you can be a part of in your home, at school or college, in your local library or at work, as well as online. Initiated by the Scottish Government and supported by National Lottery funds through Creative Scotland targeted funding, the week is delivered by Scottish Book Trust and its partners. From November 19 to 25, there are hundreds of free events taking place across many different local authority areas, funded by Scottish Library and Information Council (SLIC). For more information, visit www.bookweekscotland.com.